Cover for new record from art historian James Merle Thomas and Wilco keyboardist Mikael Jorgensen. At times, the inexplicable emotions that run though the minds of music creators carries with it the weight of traversing space. Using technological elements that bring people together over great distances, thus "minimizing" the space and time between them, art historian James Merle Thomas and Wilco keyboardist Mikael Jorgensen have created a musical experience that taps into the history of spaceflight. They dubbed the project "Quindar." These tones served as an inspiration for the duo's new record, "Hip Mobility," and they were infused with other NASA audio archives to create the songs, including "Twin-Pole Sunshade for Rusty Schweikart" and "Honeysuckle This Is Houston," which hark back to the Apollo program. 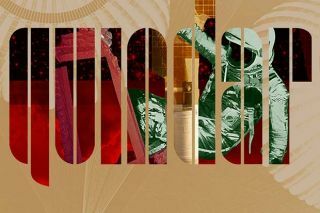 Space.com talked with James Merle Thomas and Mikael Jorgensen of Quindar in an email interview about the record's inspiration and its technical details. Space.com: In a very novel approach to composing music, you've interwoven space, time and technology into an ethereal experience. How did your interest in spaceflight history and communications technology act as a muse for the record? James Merle Thomas: Quindar evolved organically out of our shared enthusiasm for histories of art, technology and music, and is directly related to my doctoral research — I'm trained as a historian and curator of modern and contemporary art, and am specifically interested in understanding how our notion of what "modern" looks like is related to the technology and politics of the Cold War period. In 2011, while on a Guggenheim fellowship at the National Air and Space Museum, I was researching how NASA designed for space. My research was focused on how the agency's understanding of its own design shifted during the late 1960s/early 1970s, as the Apollo Applications Programs (including Skylab) drew to a close, and as the program reoriented from symbolic exploration to include a narrative about living and working in space, about scientific research in a laboratory setting, etc. One fascinating aspect of this transitional period is the rich collaboration (and sometimes tensions) between engineers, who were planning for precision and efficiency, and, on the other hand, architects, artists and industrial designers (e.g., Raymond Loewy, who designed the interior of Skylab), who were invested in questions of visual identity, orientation [and] personal space, and who were genuinely interested in matters of aesthetic design and the possibility for personal improvisation. Mikael Jorgensen: Early on in our collaboration, James suggested that we listen to some of the NASA archival audio materials he'd been gathering as potential source material for the music we were creating. It all made sense in that moment to ingest and remix not only the sounds of the space program but to utilize these recordings to provide narratives to our songs the way lyrics and singing function. Since we were trying to push our own creative sensibilities and sonic possibilities, incorporating this as a fundamental part of our working methodology we didn't see or feel the need to use our own voices. This vast archive of sound would help us figure out what we wanted to say. (An indicator lamp lights when the device transmits) Subtitle: Hey, are you there? SPACECRAFT QUINDAR MODULE: (Lamp lights, confirming receipt of the [BEEP]) Subtitle: I'm here! (Lamp lights when the device transmits) Subtitle: Are you still there? MISSION CONTROL QUINDAR MODULE: (Lamp lights, confirming receipt of the [BEEP]) Subtitle: I'm here! (An indicator lamp lights when the device transmits) Subtitle: Are you still there? This conversation continues in the background ensuring a consistent communication channel between the astronauts and mission control. So this idea that a musical conversation is being transmitted and received by a pair of synthesizers — one of which is in space — spoke very deeply to us. Space.com: You're bringing to light a little-known, but really important, component of communications with Quindar. Can you explain how it was applied when composing the record? Jorgensen: James was pretty quick to take the Quindar tones into the music software Ableton Live, assign them musical values and generate musical textures and chords using the original recordings. Thomas: I was struck by how a Quindar tone is a focused sonic element, and how, when you slow down the intro/outro tones, their subtle difference becomes more perceptible. For anyone even casually familiar with John Cage, Pierre Schaeffer and a larger artistic tradition of using found sounds in composition, it's a pretty short path to re-imagining an array of Quindar tones as a kind of musical instrument. Space.com: When you were thinking about what the title of the record should be, how did you decide that "Hip Mobility" was the way to go? I'd just like to say that we're in no way making fun of these men and women who worked diligently and seriously on these projects, but that we're empathizing with them and hopefully acknowledging some of the ridiculous things that we find ourselves doing in service of some larger goal. It's important to be serious, but not to take yourself too seriously. Art historian James Merle Thomas and Wilco keyboardist Mikael Jorgensen collaborate to create the 'Quindar' record. Space.com: Converting phenomena throughout the cosmos, that's usually inaudible by humans, into music has drawn a lot of interested folks to our site. Looking forward, is there another bit of technology, space history or a phenomenon that has been stirring the creative juices? Jorgensen: There is currently such a wealth of tools and software that exist to make almost any idea a reality. We've been lucky to work with Jeremy Roth, who does stage design and lighting for Wilco, and tap into his expertise when it comes to our live show presentation. We've been using software called Resolume Arena which allows us to cue up video and present it in real time, but also to display multiple channels at once, superimpose video and more. It's been extremely gratifying to build our live show with our synthesizers and laptops and have them communicate with the video software to put this live show together that is at once interactive and responsive to each other. "Hip Mobility" is available on Amazon. Learn more about Quindar through their website.